The TSSAA State Duals wrapped up Saturday night with perennial state power Cleveland winning the championship match in a decisive 56-9 victory over Bradley Central. The victory marks back to back wins for the Blue Raiders. As for Blackman, the Blaze ended up tied for 5th place after making it to the semi-finals on Friday and losing two in a row on Saturday to #1 ranked Cleveland and #2 ranked Wilson Central. Overall, it was an outstanding tournament for the Blaze. The only other time, Blackman made it so far was in 2013. Like any tournament, your placement in the bracket will have a huge impact on how things end up. In years past, it seemed that the Blaze always ended up with the #1 seed or #2 seed out of the gate. This year, Blackman had a great draw and took advantage of it! The Blaze won the first two rounds over Tennessee High and Beech Senior propelling them to the semi-final match with #1 Cleveland. This year, as a team, Cleveland is head and shoulders above the rest of the state. The match started off at 285 pounds with Blackman giving a forfeit. Cleveland showed why there was no mistake in their ranking by reeling off wins in the first nine weight classes while scoring bonus points in each. Blackman’s wrestlers fought hard throughout. At one point, Liam Elam had 120 pounder Burns Meagher locked up in a cradle but was unable to get the pin. At 160 pounds, things took a positive turn for the Blaze. Junior Anthony Gomez came up big with a solid 6-3 decision over Cleveland Junior Zach Brezna. Getting some points on the board was a huge relief to all. 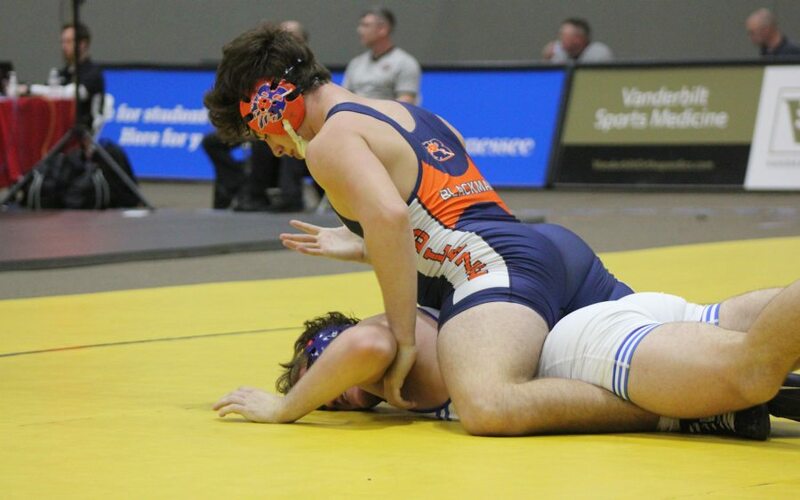 At 170, Blackman Senior Landon Fowler looked very impressive while earning a victory by FALL over Cleveland’s Ashton Davis. 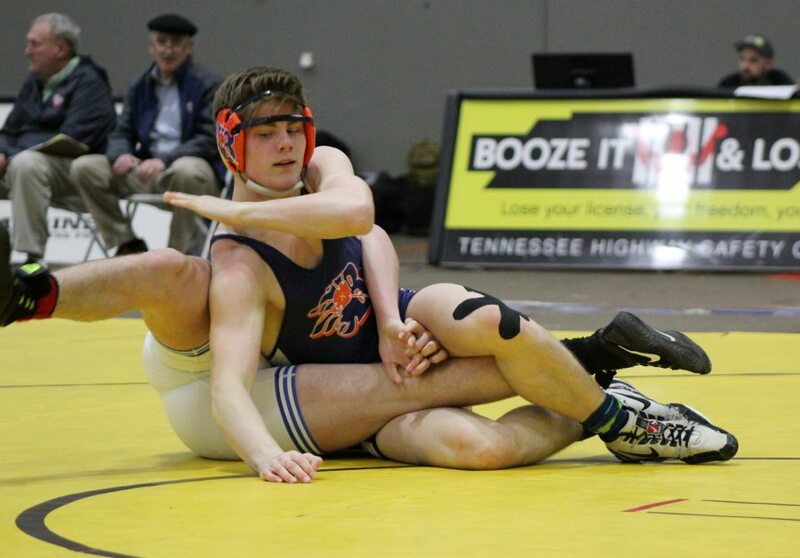 Blackman Junior Brooks Sacharczyk looked equally good in his win over Cleveland’s #1 ranked Dylan Jones. At this point, the score was Cleveland 51 – Blackman 12. Coach Joey Knox of Cleveland forfeited the remaining matches to the Blaze. Final Score Cleveland 51 – Blackman 24. Falling to the consolation rounds, Blackman’s next opponent ended up being Wilson Central. The match with Wilson Central was a bit of a surprise. Not many expected Wilson Central to lose to Bradley. (except of course Ben Smith and the Bradley coaches). All that being said, it wasn’t good news for Blackman as they would have matched up better with Bradley than Wilson Central. 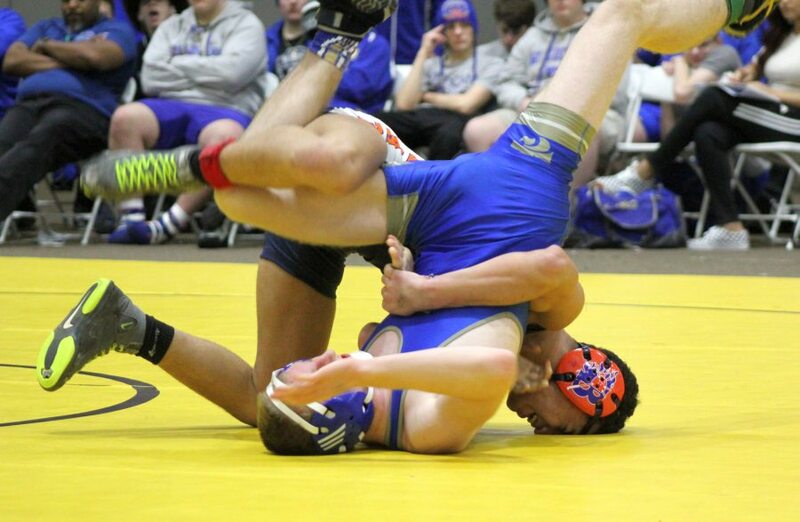 The Central match started at 120 pounds with Wilson Central’s Grant Fetters winning by decision over Liam Elam. Central won the next two matches by pin to put themselves up 15-0 early. Evan Smart got Blackman on the board with a close 11-9 decision over Thomas Oakley. Smart was up 11-4 before getting put to his back in the final seconds. He fought off the pin however to hold on to the win. Central rattled off three more in a row at 145, 152, and 160. (152 was a forfeit) Next, Anthony Gomez and Landon Fowler both bumped up a weight class and both got 1st period pins (43 seconds and 32 seconds). Central forfeited to Sacharczyk and Bowdy Boyce and Blackman forfeited 285 once again. (For a moment, it looked like Coach Bray was going to put his headgear on and take on Kramer but he apparently had second thouhgts.) 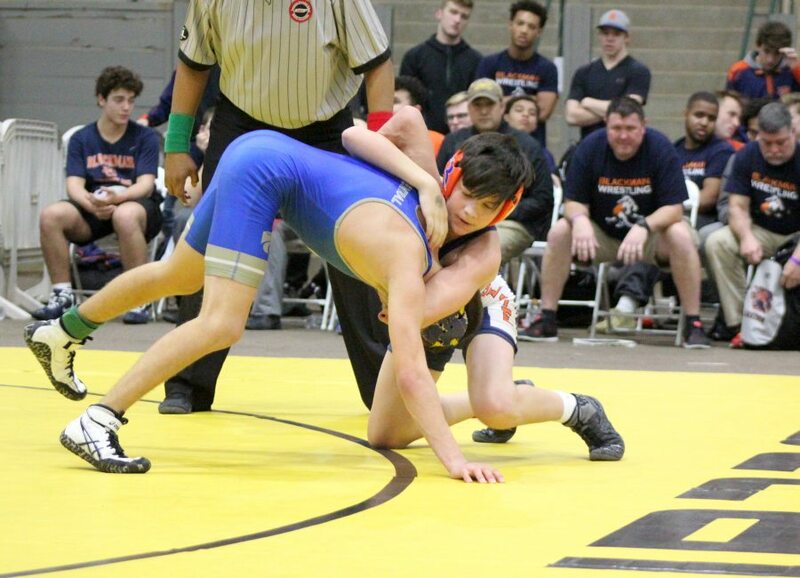 The final match at 106 was Adam Tibotoski and Michael Mercante. Adam fought tough and showed much improvement losing a close 4-1 decision. (last time they wrestled, Mercante scored 14 on him). Final Score Wilson Central 45 – Blackman 27. All in all, it was a great tournament for the Blaze. Blackman scored more points against State Champion Cleveland than any team they faced. The Blaze scored more points against Wilson Central than the team they beat for third. 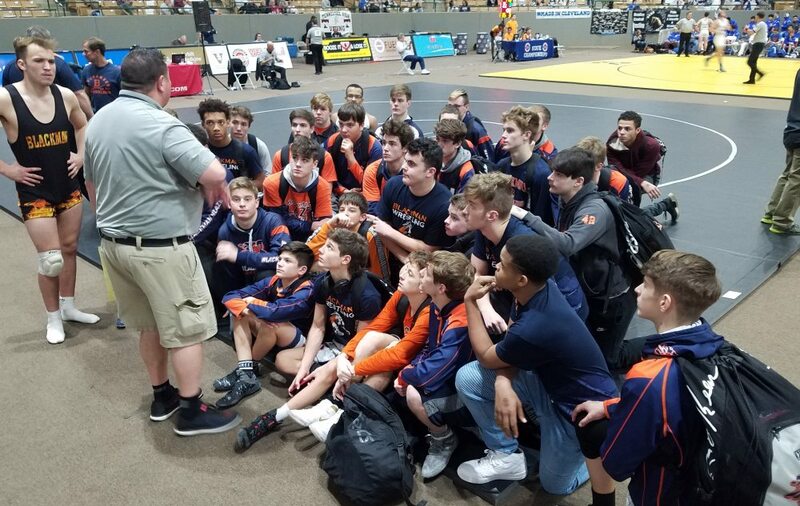 The only two teams that beat Blackman finished 1st and 3rd……..and Blackman has a win over the 4th place team (Centennial). Bottom line, this team is among the best in the state. For match summaries, click HERE. What’s next? REGION INDIVIDUAL TOURNAMENT at Warren County High School. Now that team competition is over, it’s time to put the focus on individual performances and see who the best wrestlers are! The Blaze have a talented group and are expected to compete well in the region. Last season, Coach Ronnie Bray sent 10 qualifiers to state. From the looks of it, the Blaze can better that number this season if the wrestlers wrestle to their potential. The tournament starts Friday afternoon and finishes up on Saturday. There will be several very talented wrestlers looking to punch heir tickets to state and there will no doubt be some great matches! Make sure you plan to come to Warren County to support the Blaze! !